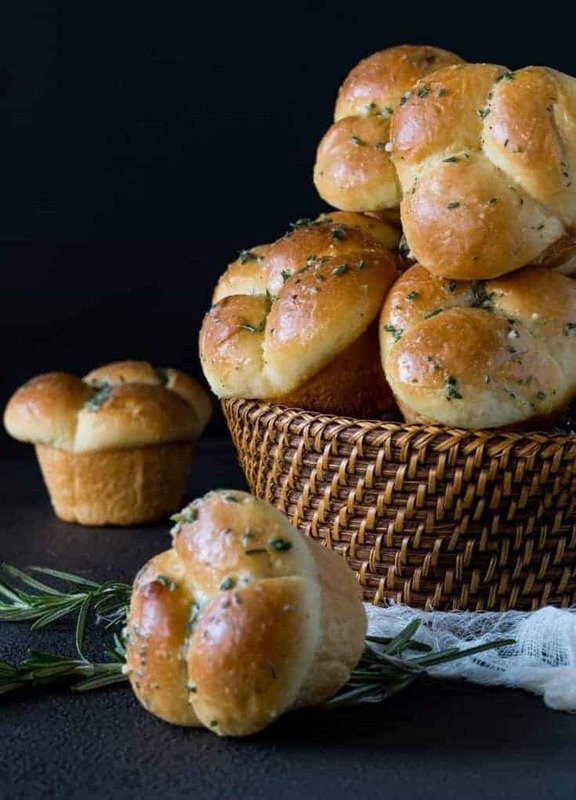 These gorgeous, homemade Rosemary Garlic Cloverleaf Rolls deserve a spot at every dinner table on holidays and special occasions. You’re more likely than not to find me swinging through the bakery at the grocery store for my standard bread and roll purchases. But I do break out the yeast and the stand mixer on a few special occasions during the year to make my own baked goods, including these Rosemary Garlic Cloverleaf Rolls. No Thanksgiving is complete without them! Rest assured; this is not a fussy, proof-the-yeast type of recipe. That’s not my style. The dough for these Rosemary Garlic Cloverleaf Rolls comes together in minutes and is super easy to work with. The recipe is easily doubled if you’re feeding a crowd, too. Plus you can easily prep these rolls ahead of time, keep them frozen until the night before Thanksgiving and then defrost in the fridge before baking them off. Right when the rolls come out of the oven, hit them with a generous brushing of melted butter mixed with fresh rosemary and garlic. The result is not only a delicious flavor boost but also a gorgeous sheen on your cloverleaf masterpieces. Tip: No time to make your own rolls? 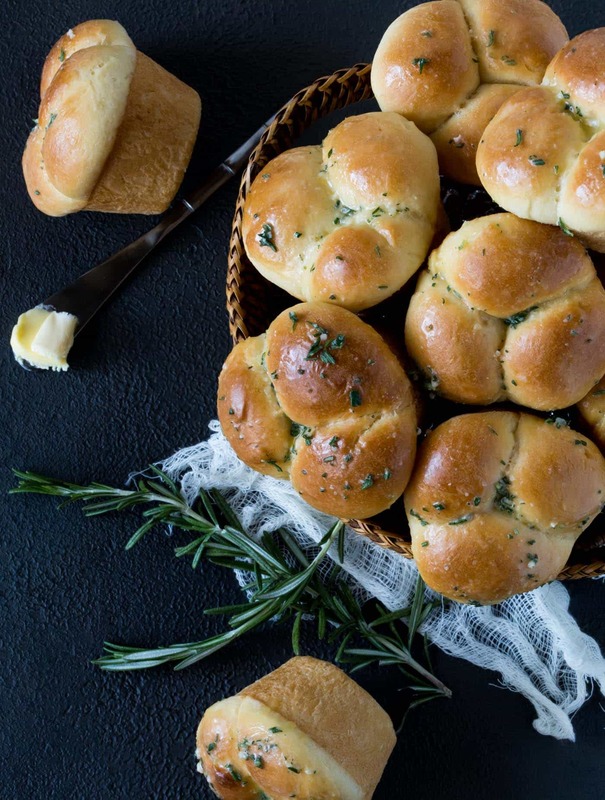 Give your store-bought rolls a little extra love by brushing the tops of them with the rosemary garlic butter. 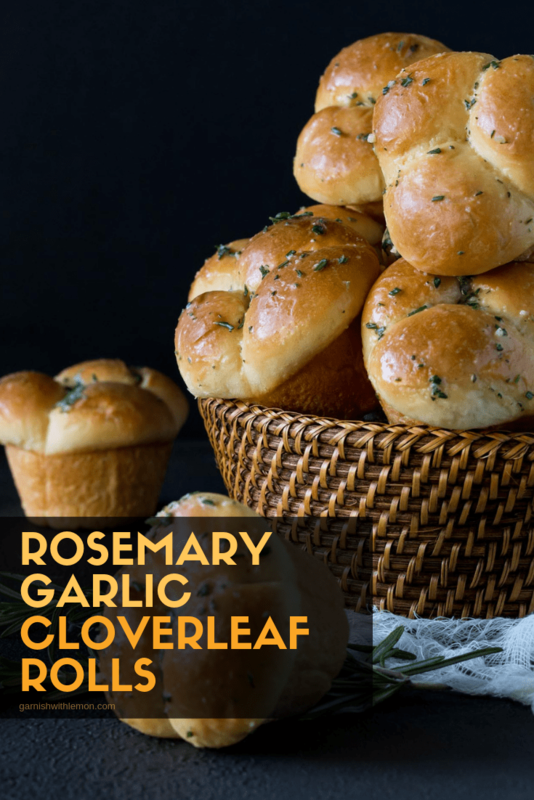 These Rosemary Garlic Cloverleaf Rolls are best served warm, so leave them until the last minute when planning your meal. Then watch they eyes light up as you pass them around the table. But make sure you serve yourself first – the basket may be empty by the time it reaches you. These easy rolls deserve a spot on your table! Add flour and next 8 ingredients (through milk) in the bowl of a stand mixer. Mix on low to combine and then knead on medium low speed for 6 minutes or until dough is smooth but still a bit sticky. Place dough ball in a large greased bowl, cover and let rise until doubled in size, anywhere from 60-90 minutes. After dough has risen, gently punch down dough and divide into twelve pieces. Divide each of those twelve pieces into three more pieces (36 small dough balls total). Roll all dough pieces into small balls. Lightly grease a standard muffin pan and fill each well with three dough balls. Cover and let rise for another 60 - 90 minutes. Preheat oven to 350 degrees. Uncover buns and bake for 20-22 minutes or until golden brown and cooked through. Meanwhile, combine melted butter, garlic and rosemary in a small bowl. Immediately after removing baked rolls from oven, brush them with the rosemary garlic butter while still in the pan. Allow rolls to set for 10 minutes and then remove to cooling rack or serve immediately. To make the buns a few days ahead of time, follow all instructions through step 3 but don't allow rolls to rise completely. They should be peeking up over the edges of the muffin wells but not busting out of them. (For me, this took about 65-70 minutes.) Gently tent the rolls with plastic wrap and freeze. Once frozen, wrap more tightly. The night before your meal, place wrapped rolls in the fridge to slowly defrost. Allow rolls to come to room temperature before baking as directed. Rosemary is one of my favorites. These are gorgeous rolls! I’ve been on the hunt for a fuss-free roll recipe for Thanksgiving next week. I do NOT have the best luck with the homemade bread thing, so these would be perfect for me! Seriously, Nicole…if I can do it, you can, too! Rosemary is my favorite herb and these rolls look fabulous. I’ll be adding them to my Thanksgiving table this year. Thank you so much for the recipe. I LOVE these rolls, Carrie. The rosemary and garlic combo is killer. I hope your family enjoys them, too! Any suggestions on how best to make these when you don’t have a stand mixer? Would they travel OK to a potluck Thanksgiving ? these rolls are perfection!!! pinning and making these for Thanksgiving!!! Great minds think alike, Karen! Could you roll each of the three small balls in the rosemary garlic butter before putting them in the muffin tins for the final rise as well as then putting more rosemary garlic butter on the top when they come out? I am just not sure if the rosemary garlic butter on all the individual balls of dough would stop them from rising properly and adhering together as they bake. If it would work do you think it would make them too rich? Hi Maureen, I can’t say for sure because I’ve never done it, but I think it’s definitely worth a try. My initial reaction is it would just add another layer of flavor. Give it a go and let us know how it turns out!